The laundry business is one industry that has been written off as trivial but its importance in our daily lives cannot be overemphasized. With the busy schedules, we all have to attend to, we definitely need them. Look at it this way, the working class men and women are so busy they hardly have time to properly take care of themselves and believe me when I say that at the end of the day, doing their laundry is the last thing on their mind, same goes with students, they get so caught up with school work and other activities that they barely have time to do their own laundry too. But no matter how stressful or tedious and tight our schedules are, everyone wants to look presentable wearing neat clothes and this is where our wonderful dry cleaners come in. we hand them our dirty laundry and just like that our laundry gets returned to us looking and smelling brand new. With this, you can understand why the dry cleaning business has easily become a source of income for many individuals, it has turned lots of jobseekers into employers. Starting up a drycleaning business is not rocket science, I mean it’s not so hard to set up. It is an interesting and lucrative business, it requires little or no skill that is If you want to start up on a small scale but if you desire to expand as time goes on, then you definitely need to acquire skills in the dry cleaning business area. The dry cleaning business requires energy (lots of it), commitment, carefulness and perseverance (things may not always seem good at the beginning but you have to persevere through it all keeping in mind that there is light at the end of the tunnel). If as a person, you do not possess any of these traits then I must say the dry cleaning business is not for you. It is not a lazy man’s work, you must be agile and ready to work at all times to keep up with the deadlines meted out by your customers. The fascinating thing about this business is that even if you start it up in the comfort of your home, if you put in adequate effort and commitment, in no time you will expand-just like that. Like every other business, the dry cleaning business requires a lot of things to start up. I am going to summarize all that in the 10 steps required to start up a dry cleaning business. These tools would serve as a guideline which anyone aspiring to start up a dry cleaning business should follow to become a successful dry cleaner. Stain removal technique; While in training to be a dry cleaner, you learn that there are different kinds of stains dirty laundry could possess as well as different stain removers for each kind o stain and also the different method of application for each stain remover. I am talking about stains that wouldn’t just go by the traditional method of soaking in water and detergent for a while. So, when a customer comes with a cloth bearing a muccour stain and you do not know anything about muccour stains, you can trust me when I say, you are in big trouble. Washing techniques; just as the materials of cloth differ, sometimes the washing technique applied to each of them is quite different, you need to learn techniques like these to avoid returning clothes to their owner in worse states than when they were given to you. Pricing; it is during training that you get to know of the current pricing system in the laundry business to ensure that when you start up your own business, you know how to tag adequate prices on the laundry you work on. Research the market: This involves doing some research work of your own, call it a statistics if you may because it involves you taking into count the number of competitions you could possibly have when you start up your own dry cleaning business. This would help you draft out a suitable business plan according to your observations, it could also help you know the needs of a particular people i.e. services they require from the dry cleaning business. Researching the market isn’t as strenuous as it sounds, it could simply be done by going about and asking people on the services they receive from the current dry cleaners they patronize and what they expect, you could even go as far as sharing questionnaires to get lots of feedback from people, if you do not feel like going about asking people or even sharing questionnaires, you could just go back to the good old internet. If you are able to carry a thorough research on the market you are about to go into, you would be able to draft out a splendid business plan. Will I start up on a large scale or on a small scale? What would be the name of my laundry business company? How much do I hope to achieve after a specified period of time? Who would I offer my service to? What will my services involve? What will make my services unique? As you answer these questions, arrange your answers according to your priority and just like that you’ve got yourself a business plan tailored just to suit your needs. Register your business: after drafting the business plan, you need to register your business with the appropriate authorities concerned. When you register your business, you get a license that allows you to operate freely without restrictions. You may be required to pay a certain fee to process your registration .it is advisable you do appropriate research to ensure that the people you meet for the registration are in fact the right people. As a business owner, registering your business gives you peace of mind and it helps you avoid unnecessary embarrassments when the authorities come looking for defaulters as it is required that every business must be registered before it begins its operations. Financing and budgeting: to start up any business at all, you definitely need financing. In the dry cleaning business, capital is key, its capital intensive, you definitely need capital for the purchase o equipments or even renting of equipments and even to attain your workplace. You could source for capitals from banks, from relatives, also from contributions we do amongst ourselves i.e. if you do any contribution at all. I advise working on the side and gathering enough money to start up your own dry cleaning business. Once you have sourced for income, the next thing on your to-do list should be to plan a budget, it’s kind of like drafting a business plan but it deals mainly with figures. You do not need to be an economist to know how to manage your funds, you only need the simple knowledge of how to plan a budget. First off, what is a budget? It is an estimation of revenue and expenditure over a specified period of time. At an interval of times, it is usually re-evaluated. For your dry cleaning business to succeed, you should plan a budget which would enable you to prevent overspending and wasting of resources and also mismanagement of funds. Does the location meet your target; the location you choose to start up shop must meet the target people you wish to offer your services to. If you hope to offer your services to working-class men and women, then you should not be considering setting up shop near schools, you should try to set up shop close to companies. Adequate amenities; it goes without saying that the dry cleaning business makes use of amenities like power supply, water and so on. So when choosing a location to start up shop, you must ensure you pick a location with these amenities you dry cleaning business needs. Closeness to your home; when choosing a location for your dry cleaning business, it is very important that you ensure the location is not far from your home, If the distance between your home from your shop is too far, at the end of the day, you discover that you spend a lot of money on transport, money that could be used for other purposes. Also, sometimes the far distance between your shop and your home could deter you from coming to work sometimes and we all know consistency is the key to making a business stand the test of time. You do not need to purchase everything if you do not have the money for it, you could just place them in an order of priority and purchase the ones more important at the time. Human resources: labor is quite helpful in a dry cleaning business, the amount of labor you hire is dependent on how large you want your business to be, if you are starting up on a small scale you could just hire about 2-5 workers, if its large scale, 15-20 workers will do. Also, it is not a necessity to hire experts in the dry cleaning business, you could just give them few tips here and there and supervise their work just to ensure it meets the customers standard. Advertisement: it is not enough to just start up your dry cleaning business; you also have to spread the word know, let people about you and what you do. You could this by distributing flyers, talking to people and so on. Believe me, with good advertising skills, you would never run out of customers and of course, the catch here is to provide services that keep them coming. Conclusively, the dry cleaning business is an amazing business, you put in just the right amount of effort and overtime your returns are mindblowing. It may take a while before you are established and are able to stand on your own two feet but you will definitely get there. 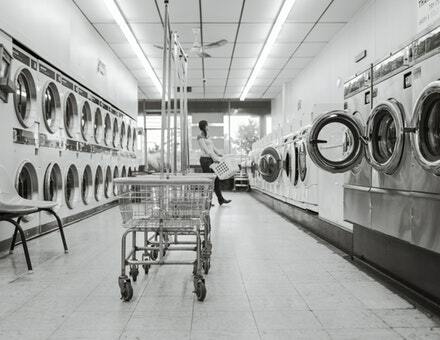 So, I reach out to every person reading this article who wishes to start a laundry business and advise them to follow the steps listed above, see them as guidelines and trust me when I say you will run an excellent dry cleaning business. ← 7 Lessons Learnt from Top Female Entrepreneurs. HOW TO IMPROVE YOUR WRITING SKILLS.